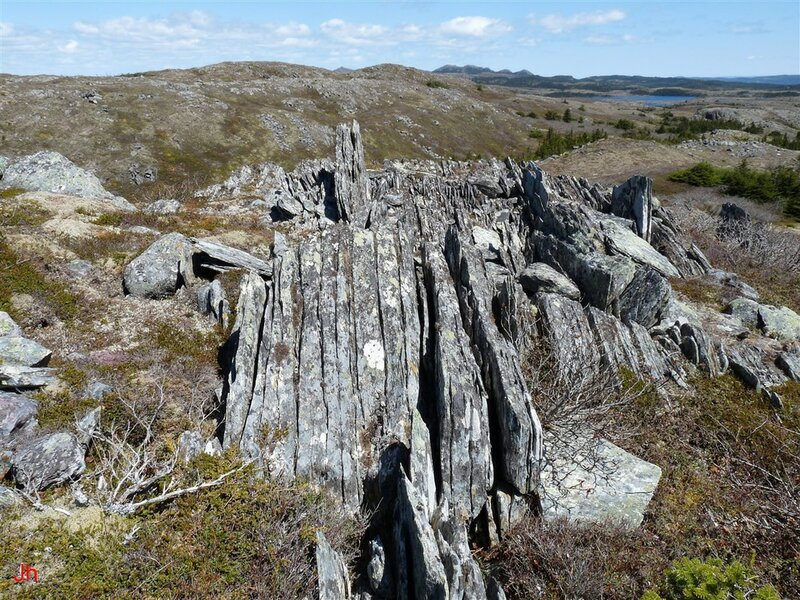 The frost-heaved monoliths featured in this group are layered specimens where distinct and steeply dipping longitudinal cleavage has led to frequent repeating joint/fissure development. 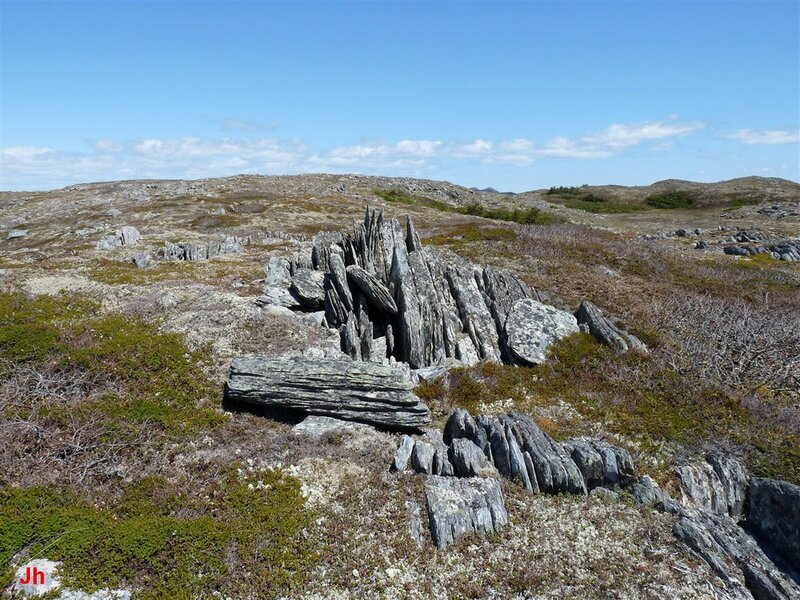 These layered monoliths most commonly occur in regionally metamorphosed sedimentary rock (slaty texture), but they also occur in phyllosilicate-rich metasomatized volcanic rock. 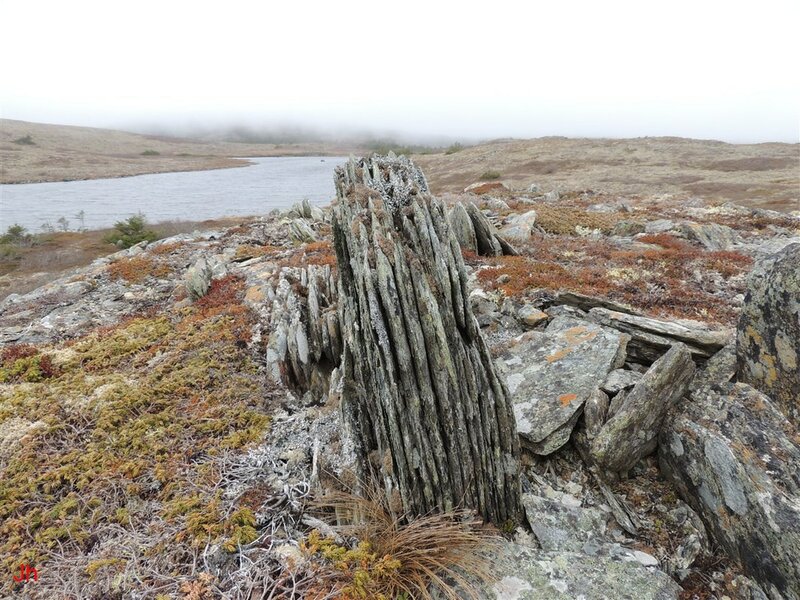 The layered frost-heaved monoliths tend to be fragile and thus they provide evidence of a lack of significant glacial erosion in the time following their formation. 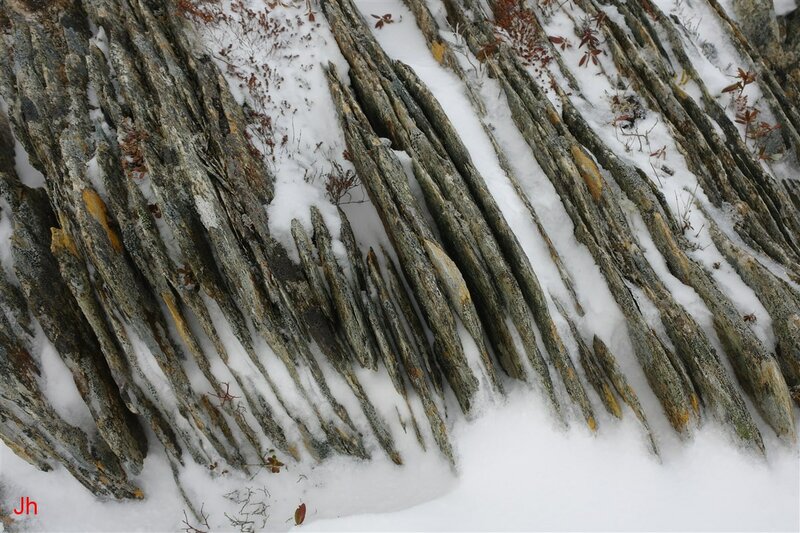 The prominent periodic joints observed in the layered monoliths and in the adjacent bedrock substrate may relate to modes of propagation of water molecules through frozen bedrock and to the resultant widening of joints by ice segregation. All of the layered frost-heaved monoliths described in this section were found in areas where convincing observational evidence points to a subglacial origin for the frost-heave features. The interpretations of the observations of ice-disrupted bedrock in this section are guided by the subglacial ice segregation/cold deglaciation model (Technical Note 11). The frost-heaved monolith shown above is about 80 cm high and was formed from metamorphosed alluvial siltstone. The pronounced layering is due, at least in part, to widening of joints by recent weathering. 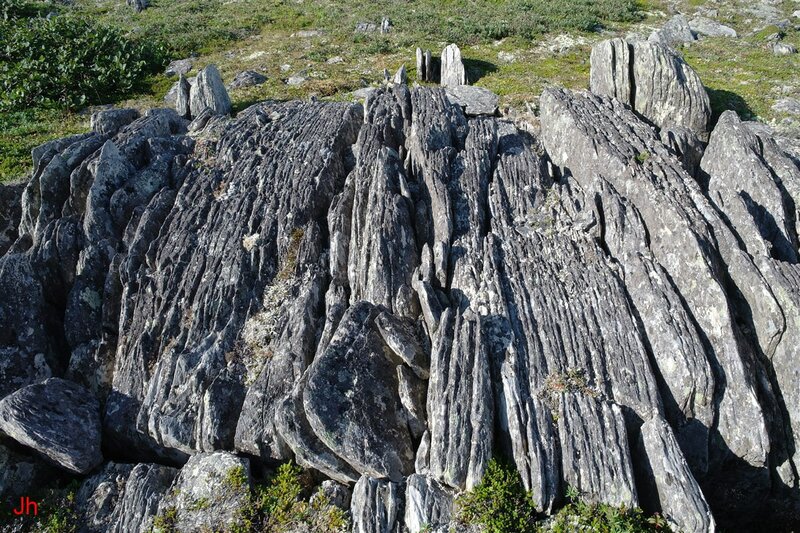 Similarly, delamination of the monolith (fallen slabs on right) could reasonably be attributed to freeze-thaw weathering or other weathering occurring during the Holocene. The periodic nature of the eroded layers requires consideration. 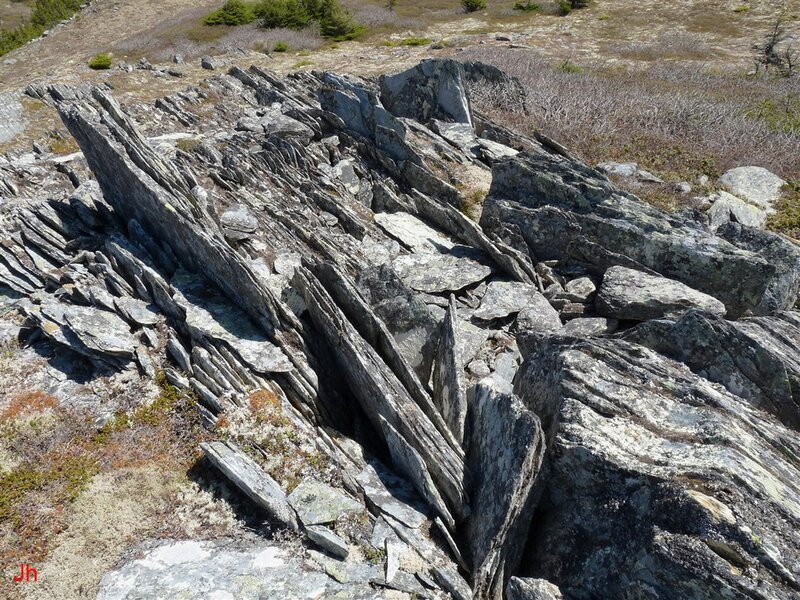 The bedrock at this location has been subjected to low-grade regional metamorphism and the layers follow cleavage imposed on the rock by longitudinal compressive stress. 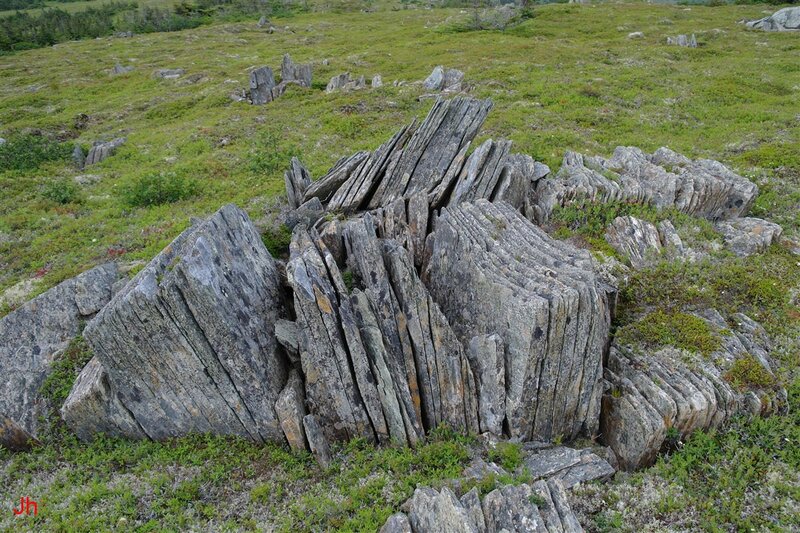 The bedding in this sedimentary rock occurs at right angles to the cleavage. 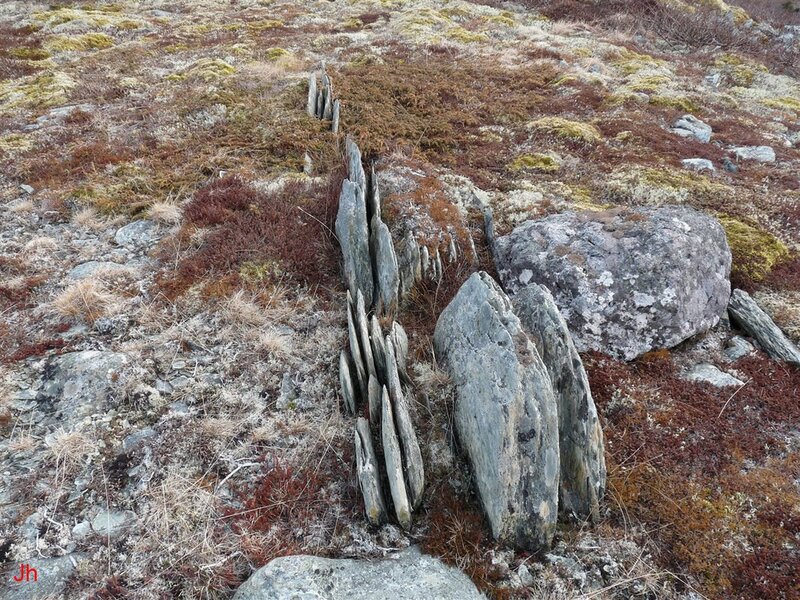 The key question is: Are the repeating widened joints intrinsic to the rock (hence of ancient tectonic origin), or are they solely an artifact of Quaternary erosion? 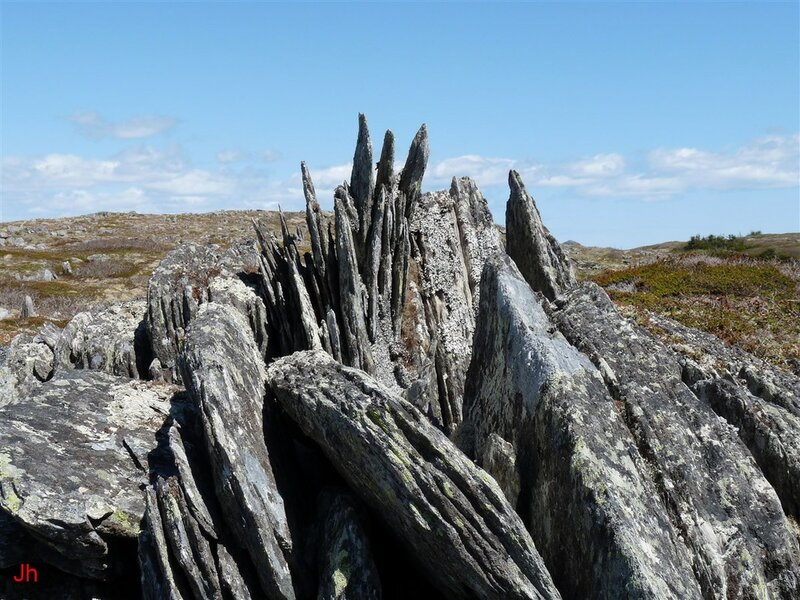 If the widened joints are solely the result of erosion, then a secondary question becomes: Did recent erosion by rain and frost initiate the observed periodic layering or is the erosion following preexisting joints that were initially widened by late Pleistocene processes associated with the frost-wedging action that lifted the monolith? It will be argued in this section that the bedrock substrate (considered on the centimeter scale) is essentially homogeneous, not separated into layers, and that the eroded layering seen above is therefore not intrinsic to the rock. 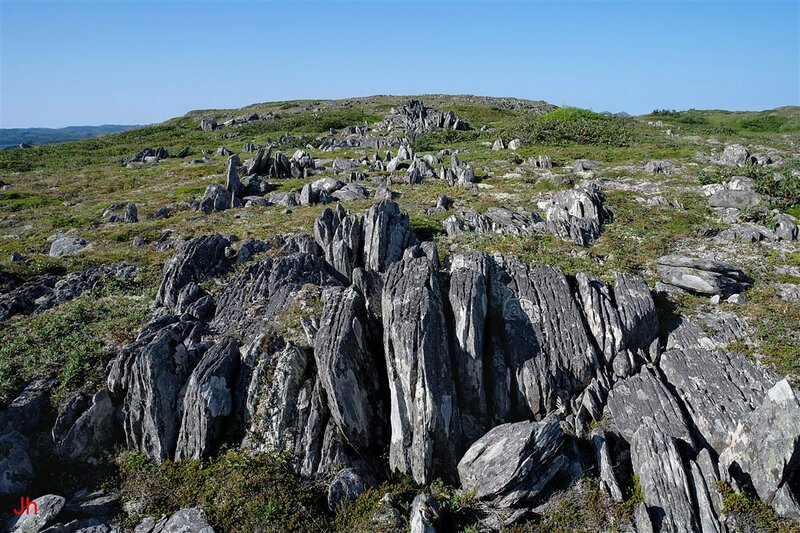 Furthermore, it seems unlikely that Holocene erosion divided homogeneous rock into evenly spaced layers, as seen, without the aid of an underlying periodic pattern of widened joints. 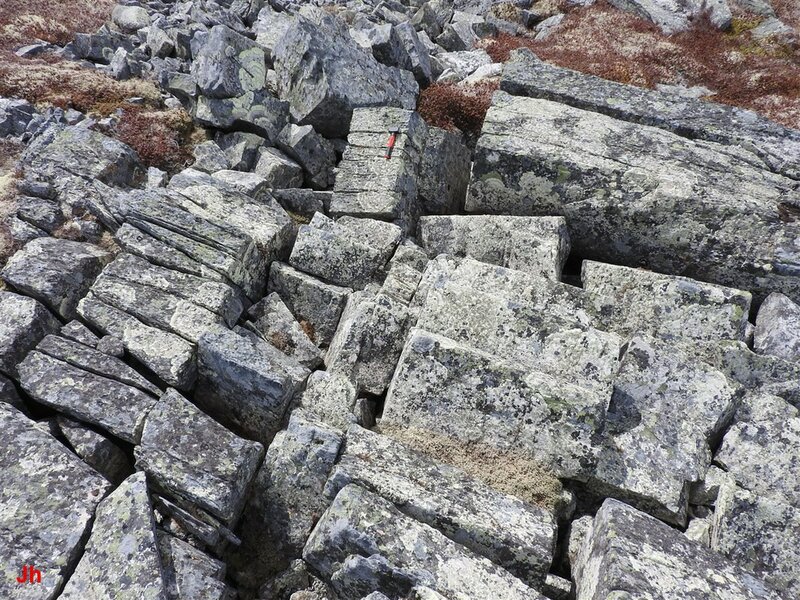 The repeating widened joints may be an indicator of frost wedging that occurred in conjunction with the lifting of the monolith. 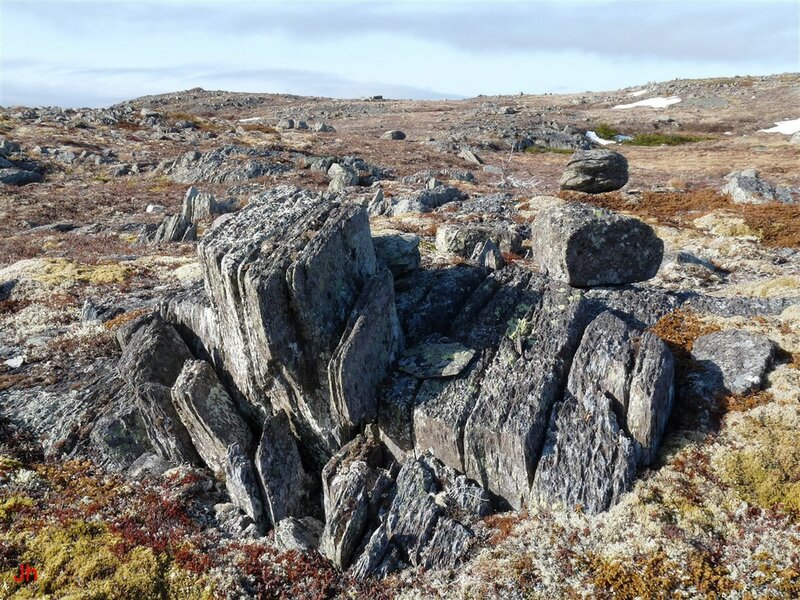 The best evidence for this type of conclusion is found in a good correlation between observations of distinct periodic jointing in bedrock and occurrences of abundant frost-heaved monoliths. The first (top, left) photo above shows a tightly spaced group of layered frost-heaved monoliths. Note the hammer (27 cm long) just left of center in the photo. The second (top, right) photo shows a thin slab (coin is 2.5 cm dia.) of slaty metamorphosed siltstone taken from the outcrop shown top, left. The third (bottom) photo shows a closeup of the metamorphosed siltstone slab. Note the thin, wavy bedding planes viewed edge-on in the third photo. 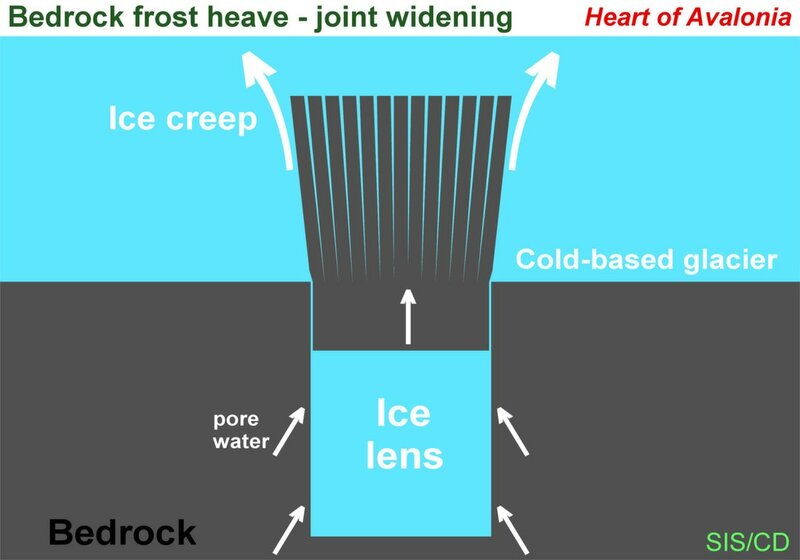 The following diagrams illustrate a possible description of the frost-wedging processes underlying development of layered frost-heaved monoliths. In the above diagram, it is assumed that pore water with pressure in excess of ambient hydrostatic pressure is present in subglacial bedrock. The over-pressure of the aquifer at depth exceeds the pressure at the glacier/bedrock interface (interface occurs at top of diagram, glacier not shown) and water thus migrates upward. It is further assumed that temperature decreases in the upward direction and that the temperature of the bedrock shown in the diagram is everywhere below the pressure melting point of ice. 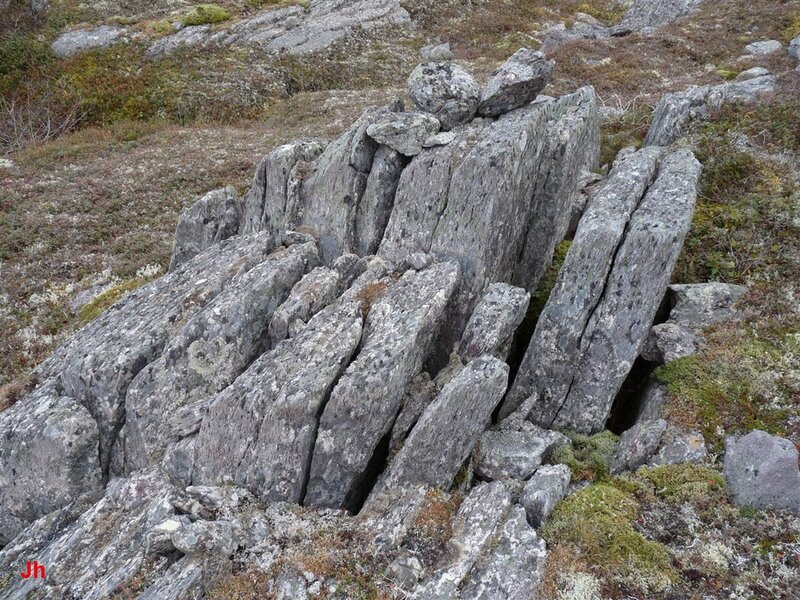 A reduction in lateral confining pressure in the rock nearing the glacier/bedrock interface allows widening of gaps parallel to the cleavage planes in the rock. The gaps become sites of ice segregation and the accumulating ice forces the gaps to widen from molecular dimensions to macroscopic dimensions. Premelted ice travels through bedrock pores and along the surfaces of segregated ice masses. The above diagram shows the development of a layered frost-heaved monolith, given the conditions described in the previous diagram. Segregated ice spreads from vertically dipping longitudinal joints into a horizontal cross joint. A monolith is pushed upward as a thick ice lens develops beneath a block bounded by longitudinal joints and horizontal and vertical cross joints. The block advances into the overlying cold glacier as glacial ice is deformed via creep and displaced. 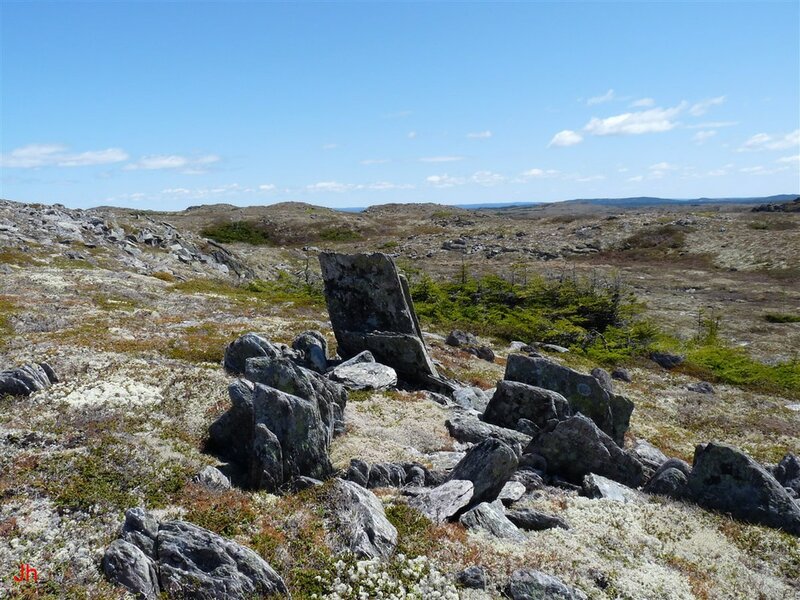 When glacial conditions end, the widened joints in the frost-heaved monolith become targets for enhanced erosion by rain and freeze-thaw weathering. 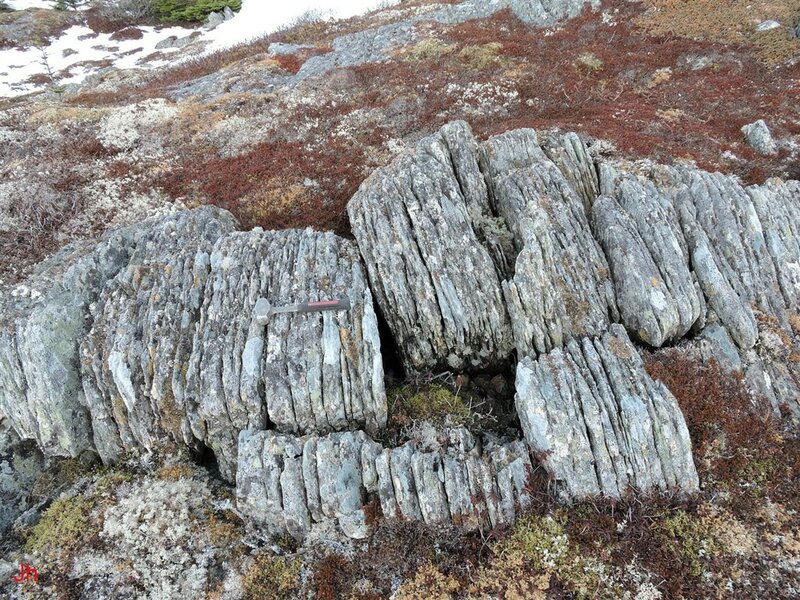 The following pictures show nine examples of layered frost-heaved monoliths occurring in metamorphosed sedimentary rock. 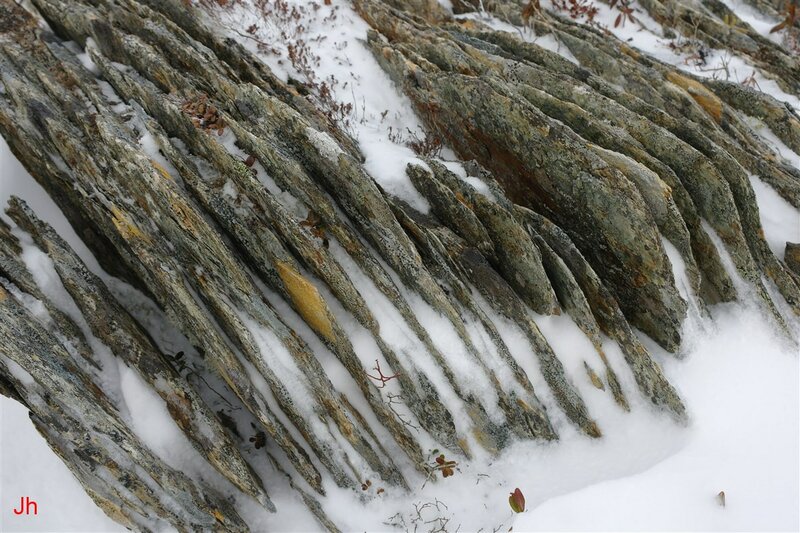 The following five photos show periodic layering in additional detail brought out by snow between the layers. 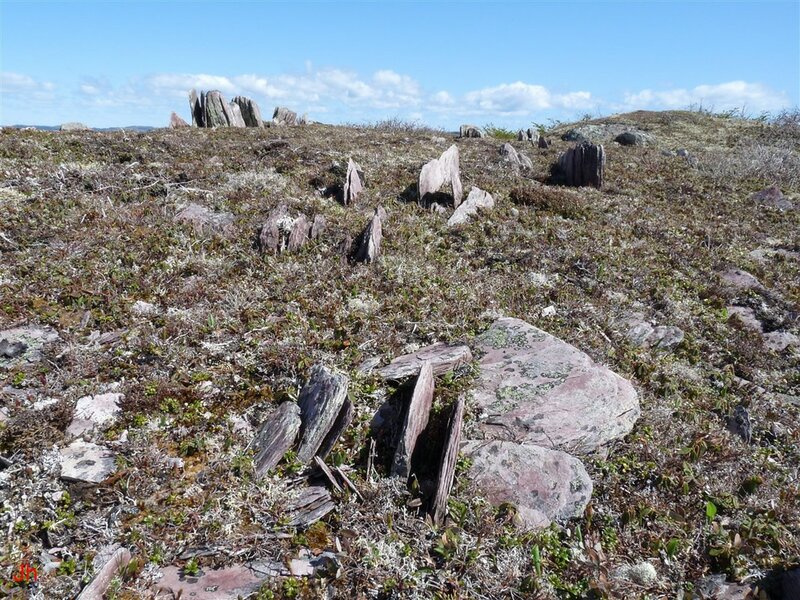 As some locations, substantial areas are affected by frost-widened layering and by the presence of abundant frost-heaved monoliths. Examples are shown below. 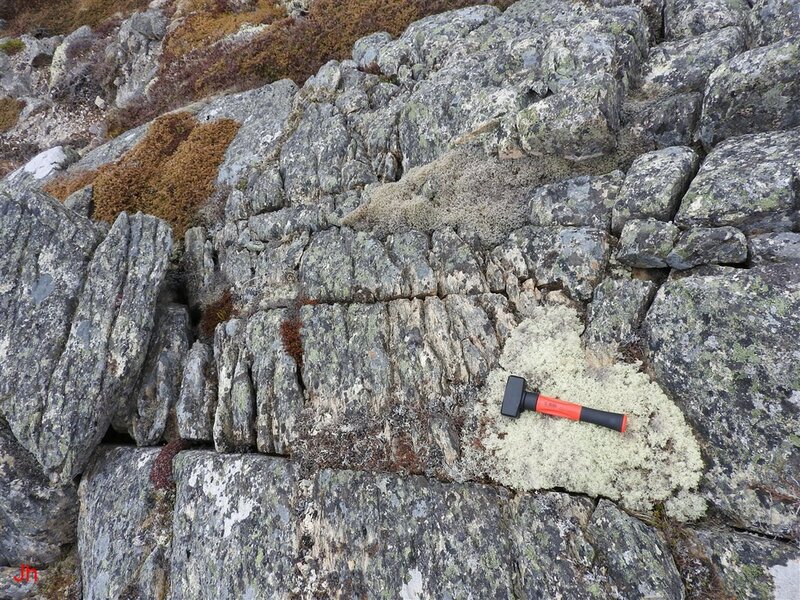 The immediately preceding photo shows an area of particularly intense disruption of layered bedrock. A frost-heave feature above and to the left of center in the above frame is shown in more detail below. 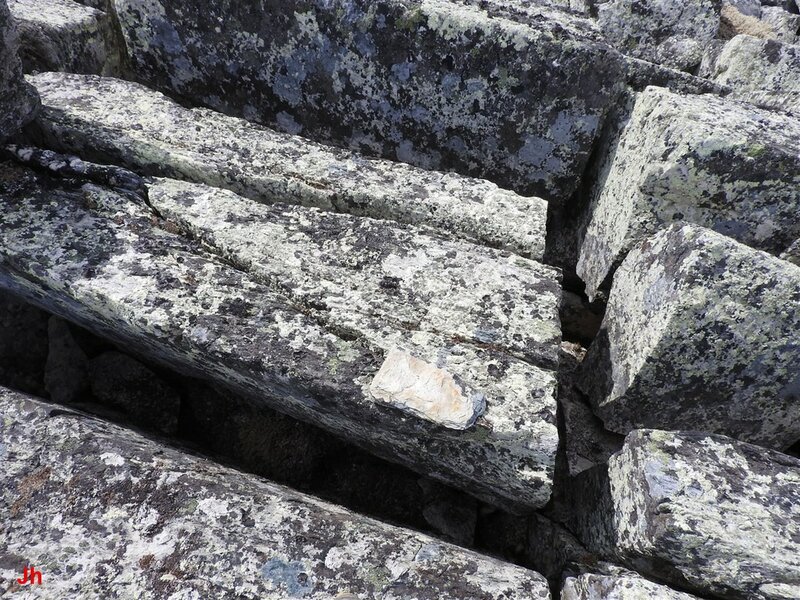 The above photo shows a frost heave feature in metamorphosed siltstone that demonstrates pronounced ice-induced joint widening. Evidence that the feature is subglacial in origin is provided by the layered joint block seen in the foreground just left of center. 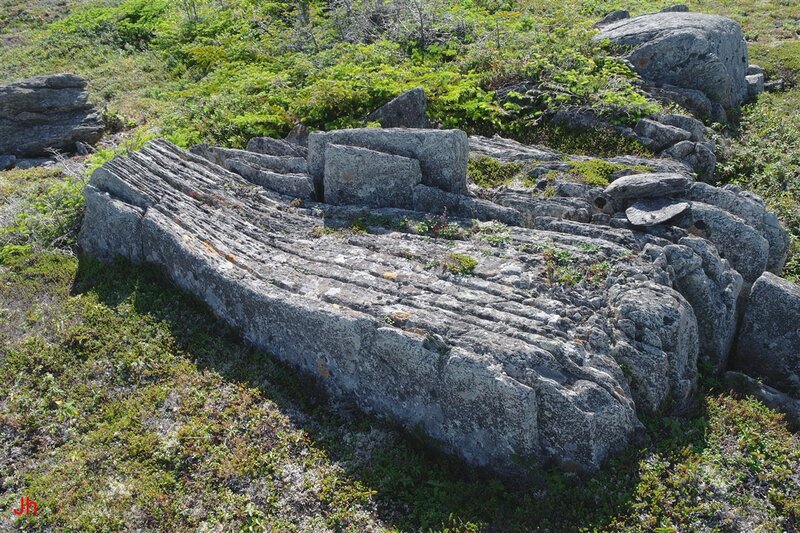 This joint block, about 1 m long and now tipped over by 90 degrees, was displaced from the hole appearing at the bottom right of the above photograph. The direction of displacement corresponds with other independent indications of ice creep direction in the area. 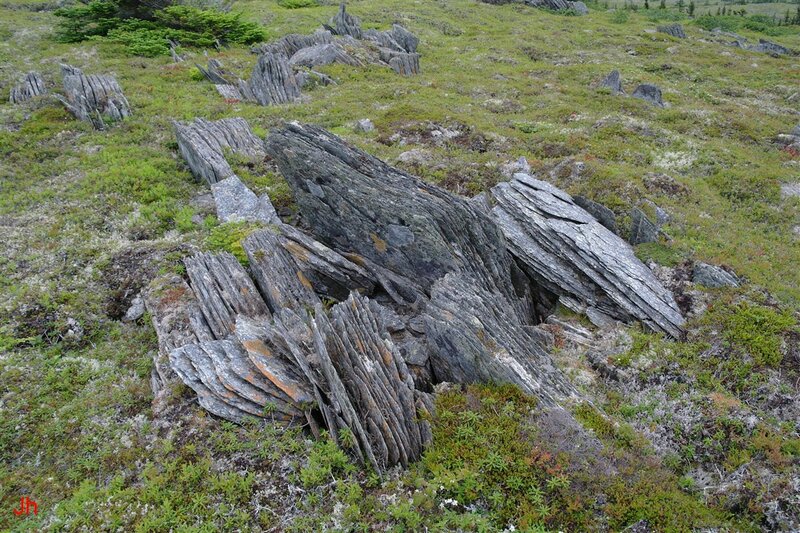 The survival of the fragile sheets of frost-heaved rock at the top of the larger frost heave feature (see photo below) suggests that glacial ice creep had ceased by the time that these sheets of rock were shifted into their exposed position. 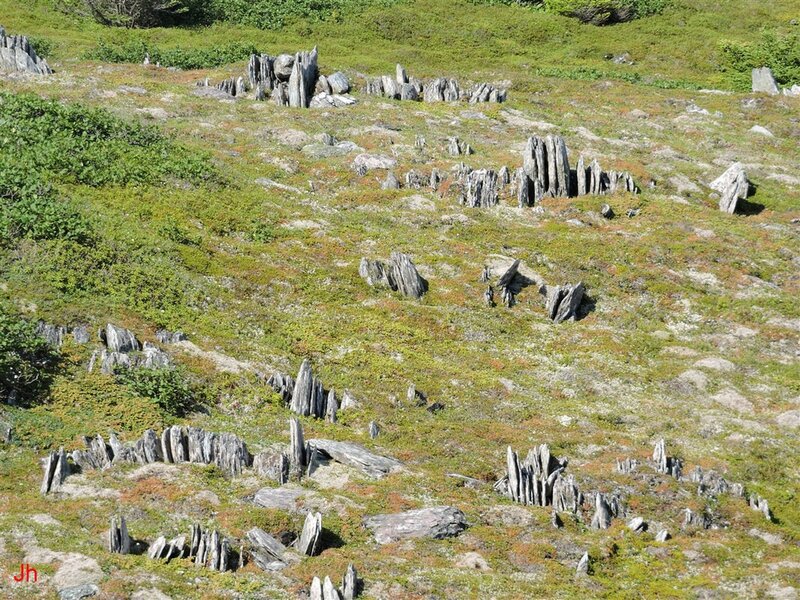 The following thin, fragile, layered monoliths provide evidence that basal slip glacial ice movement did not occur after the illustrated frost heave features were formed. The frost-heave features shown in the first two photos are less than 20 cm high. 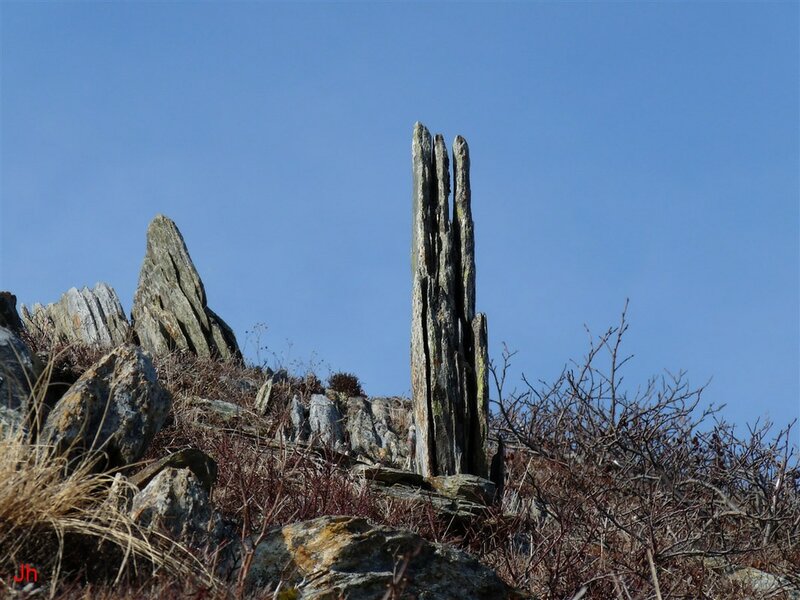 The tallest features shown in the middle two photos are about 80 cm high, while the narrow feature seen edge-on near the center of the last photo is 62 cm high. 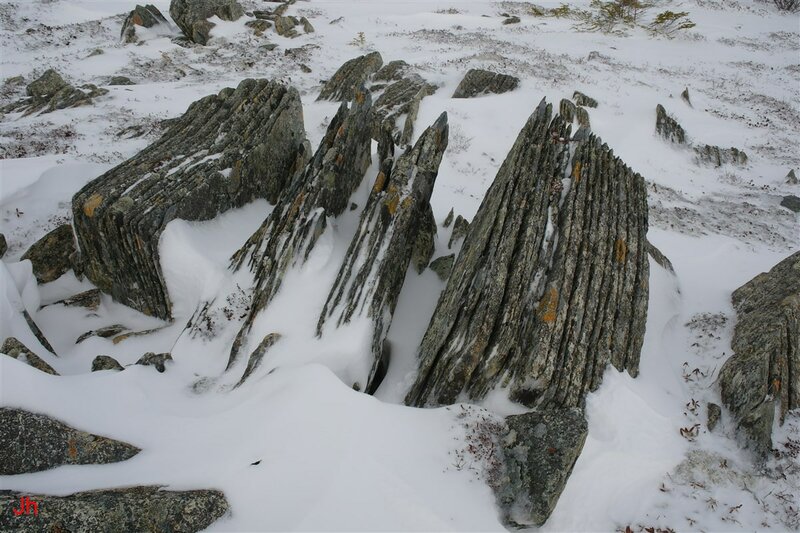 The same frost wedging processes that led to the formation of layered frost-heaved monoliths also caused intense disruption of metamorphosed sedimentary bedrock in many areas. Examples are shown below. 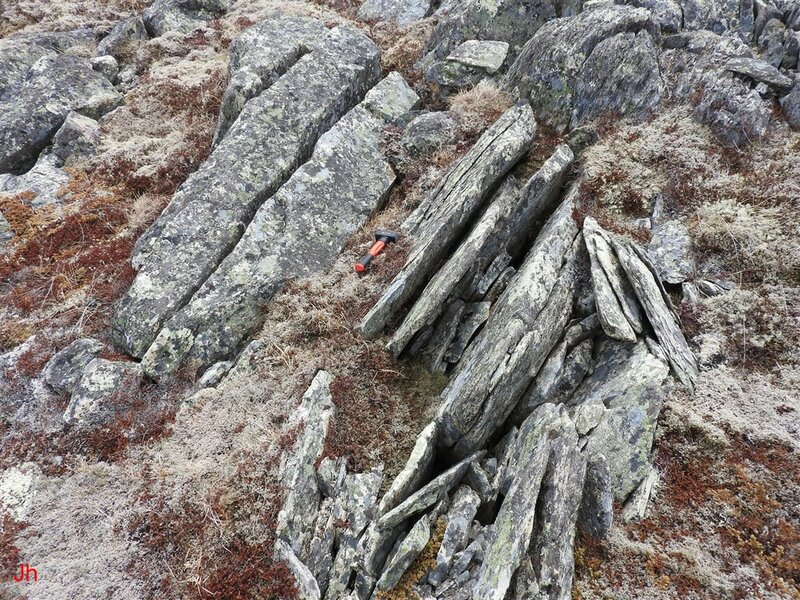 The bedrock illustrated above (field of view about 3 m wide) shows pronounced layering by periodic widening of joints. The joint widening is accompanied by severe bedrock disruption, suggesting that a potential link exists between the two processes. 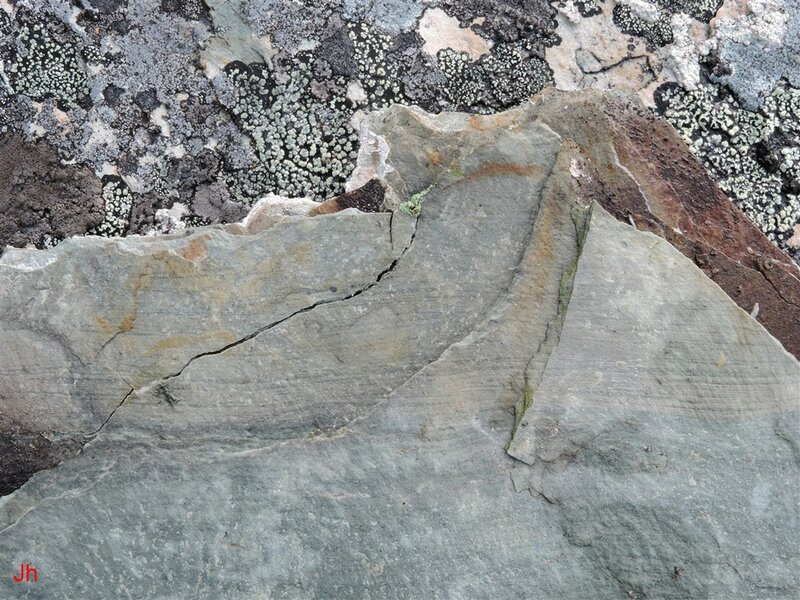 The photo below shows a detail from a bedrock surface where erosion has exploited the distinct underlying cleavage in the metamorphosed sedimentary rock. The field of view in the above photo is about 40 cm wide. 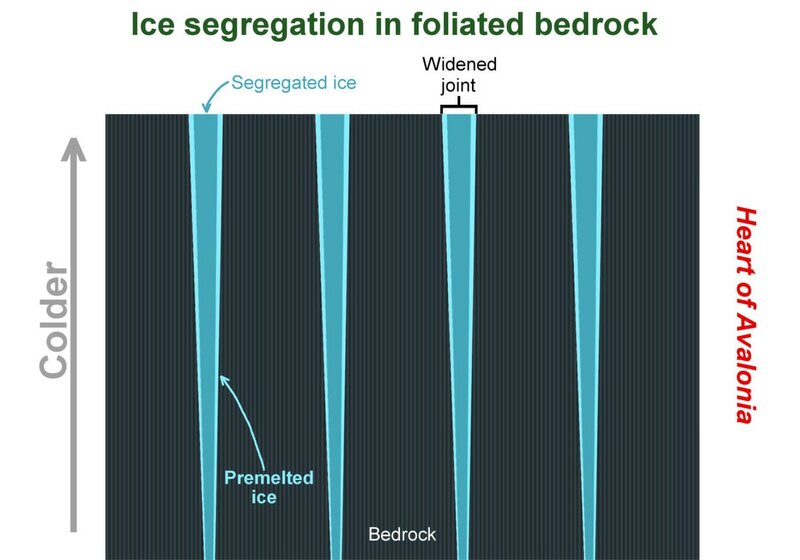 The illustrated horizontal bedrock surface was adjacent to areas of ice-disrupted bedrock and it appears likely that the enhanced erosion along cleavage planes was facilitated by prior widening of joints by subglacial ice segregation. 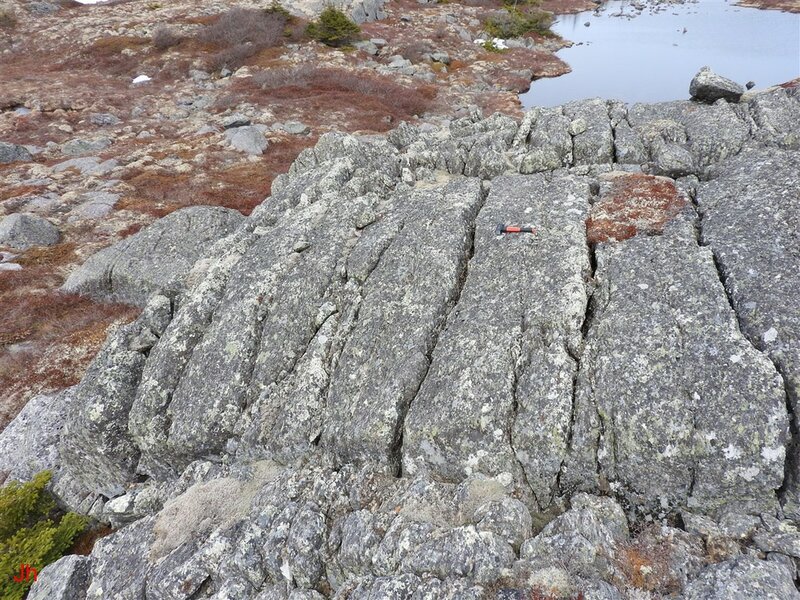 Four further examples of joint widening and layering in ice-disrupted sedimentary bedrock are shown below. The layering in all four cases is of metamorphic origin. 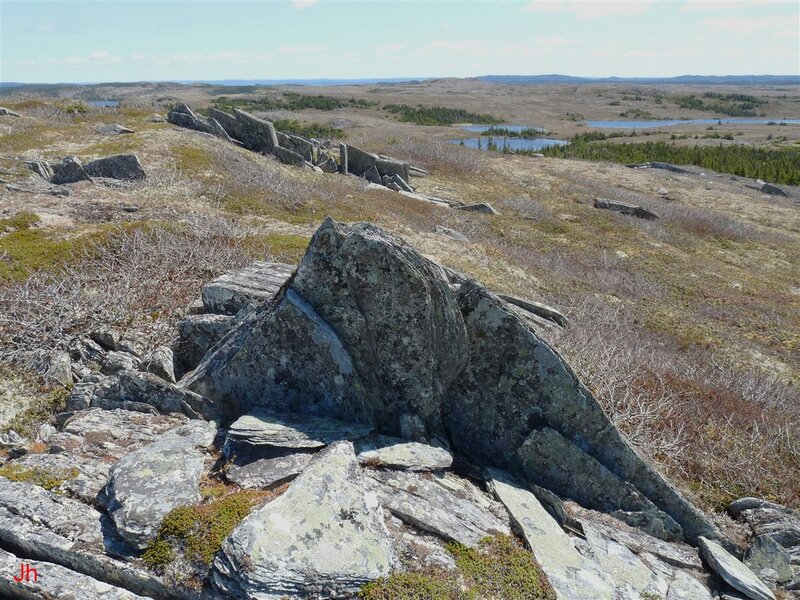 The two photos immediately above show areas of ice-disrupted bedrock from the north-central region of the Carbonear subpeninsula. All preceding photos in this section were taken on the Isthmus of Avalon. 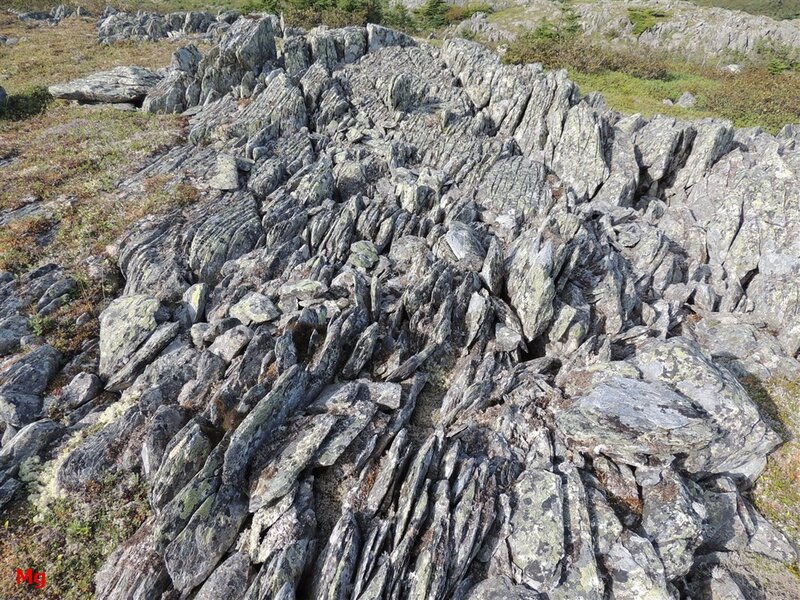 The rocks shown in the above photos are alluvial siltstone, metamorphosed by tectonic compression and layered parallel to longitudinal cleavage. 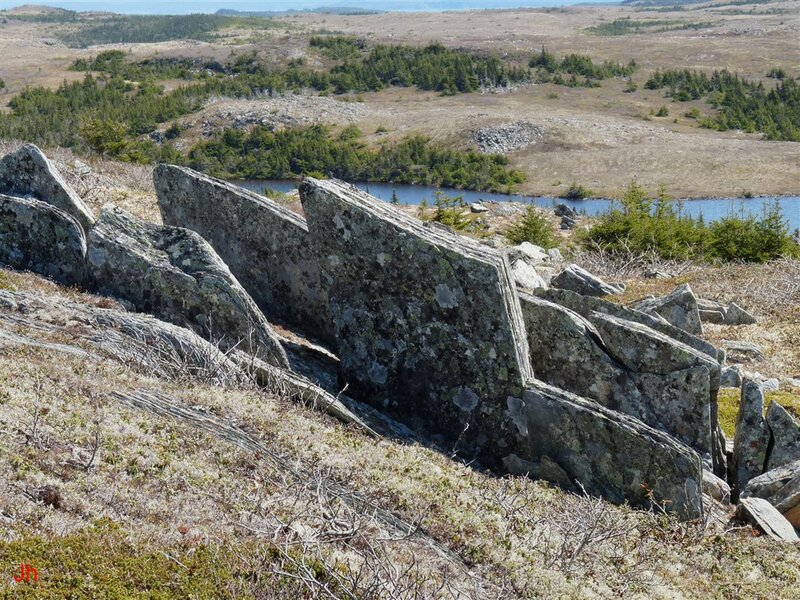 This type of rock is abundant on the north-central inland areas of the Carbonear subpeninsula, covering many 10's of square kilometers. 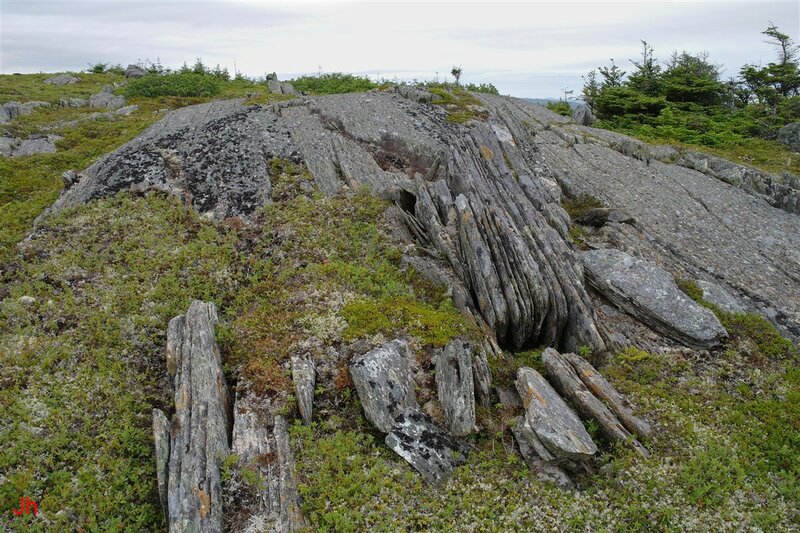 In the numerous and widespread areas where bedrock is exposed, layering such as is illustrated above, is common. 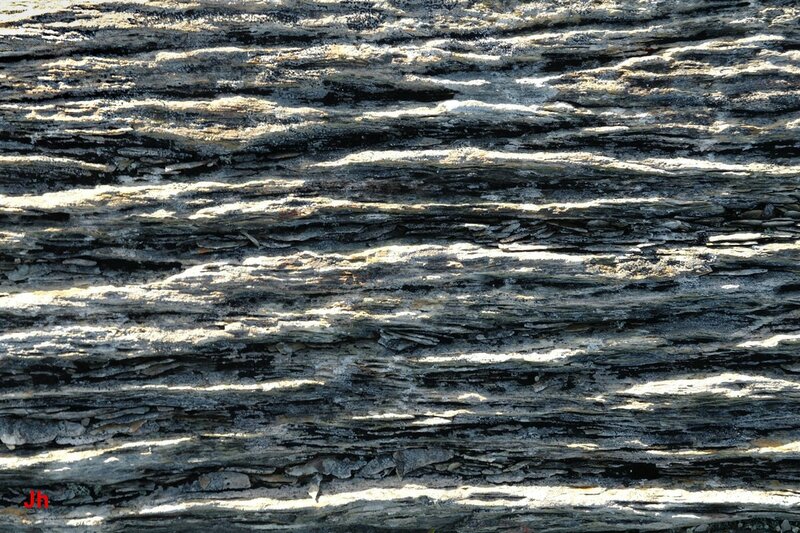 The layering is frequently accompanied by intense bedrock disruption and by the abundant occurrence of frost-heaved bedrock monoliths. 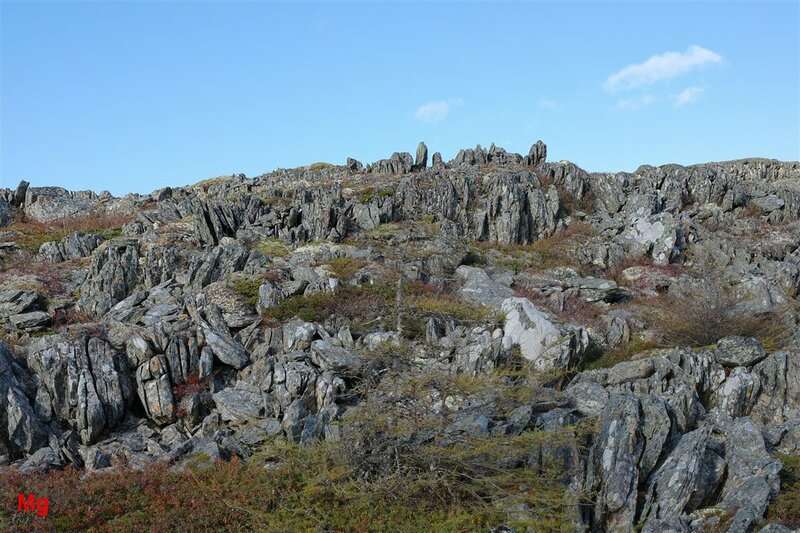 The processes underlying joint widening and associated bedrock frost heave are significant geomorphic processes on the north-central Carbonear subpeninsula. The fragility of the resultant landforms makes this region vulnerable to rapid and severe erosion during a future glacial interval where basal slip ice motion becomes prevalent. The above photo shows a small cliff formed by glacial erosion that cleaved off and then removed a section of rock following a cross joint which now defines the illustrated cliff face. The hammer, standing alongside a frost-heaved joint block, is 27 cm high. The bedrock, occurring on the Isthmus of Avalon, is metamorphosed siltstone. 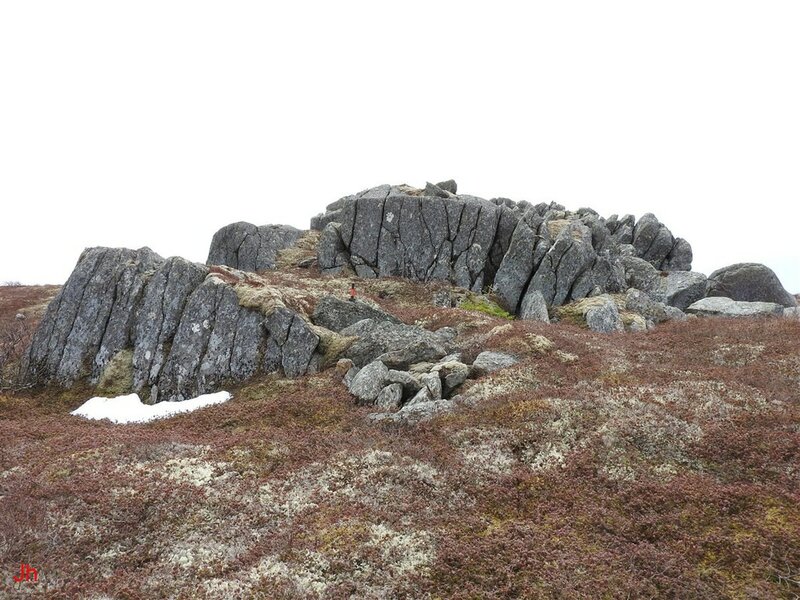 The feature reveals widened repeating longitudinal joints extending downward from the surface more than 1.5 m. Two views of the highly disrupted top surface of this feature are shown below. 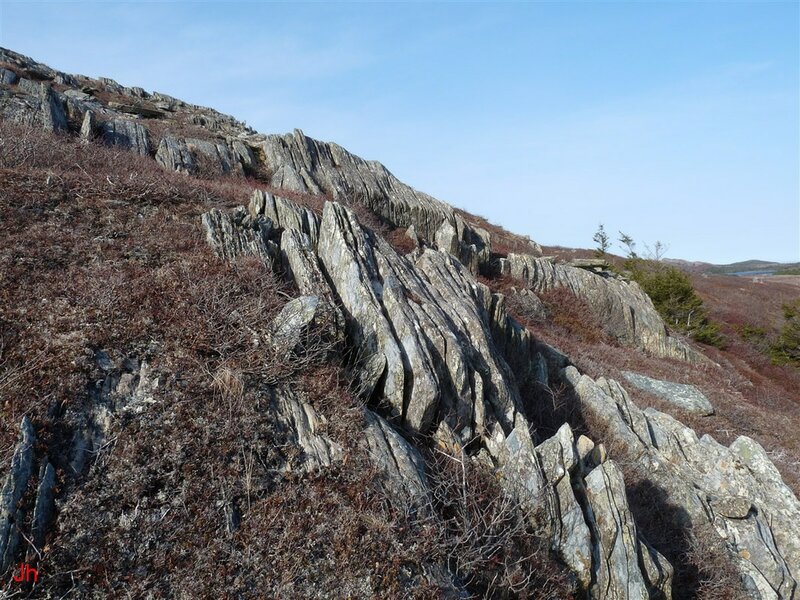 It must be assumed that the glacial erosion (presumably basal slip erosion) that carved the front cliff face of the above feature preceded the frost-wedging episode that disrupted the horizontal surface bedrock. Otherwise, the delicate frost-heave features seen in the above photos would have been obliterated. 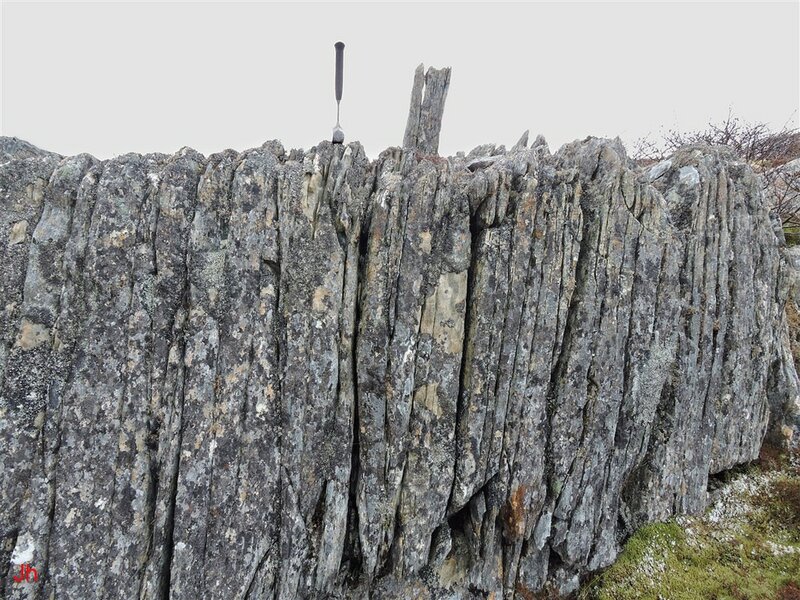 A question then arises as to why the internal pressure that lifted the observed bedrock frost-heave features did not also push rock outward from the front cliff face. It is probable that the answer lies in higher glacial ice pressure acting against the cliff face than acting downward against the top horizontal surface. Additionally, the thermal gradient driving ice segregation might reasonably be assumed to be directed normal to the top surface, favoring ice development in the upward direction, although this was probably a minor factor. 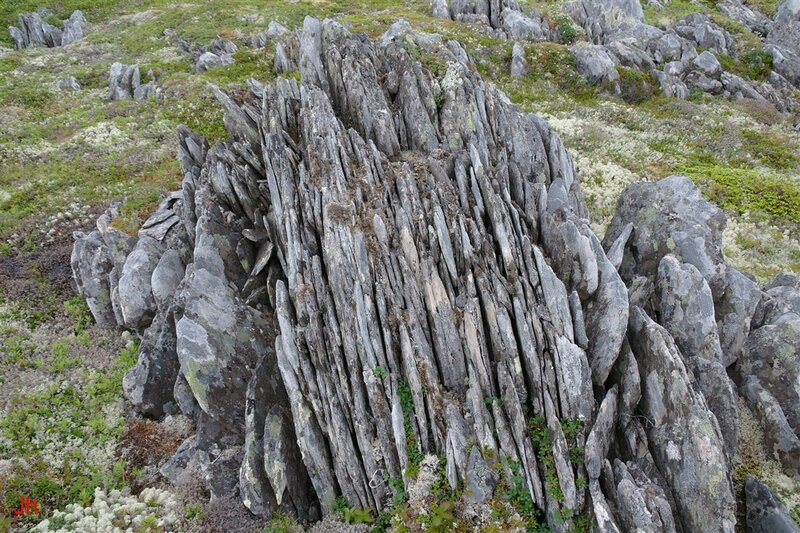 Repeating widened joints paralleling cleavage are also observed in frost heaved volcanic rock (metasomatized, regionally metamorphosed tuff and ignimbrite) as illustrated in the above photo. Generally the layering is coarser and less pronounced than that seen in sedimentary rocks. Further examples are shown below. 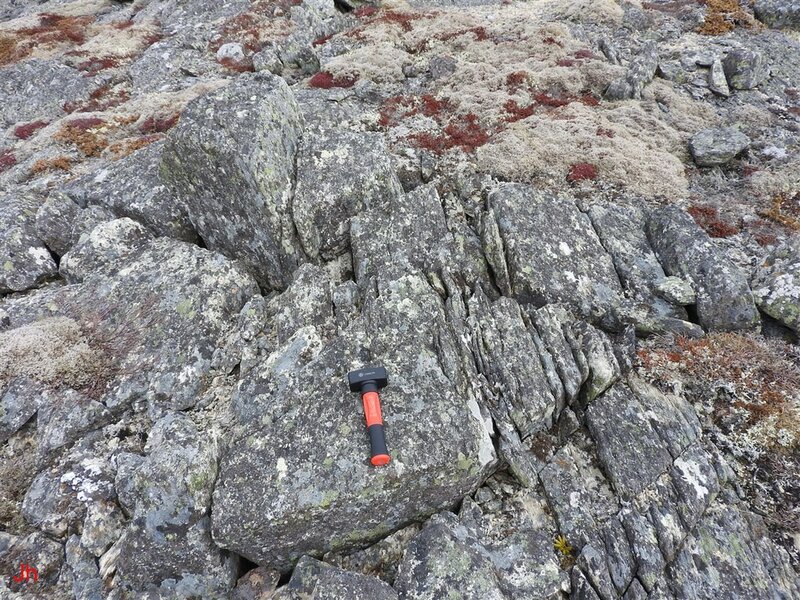 All of these examples are found in volcanic rock on the Isthmus of Avalon (Bull Arm Formation). 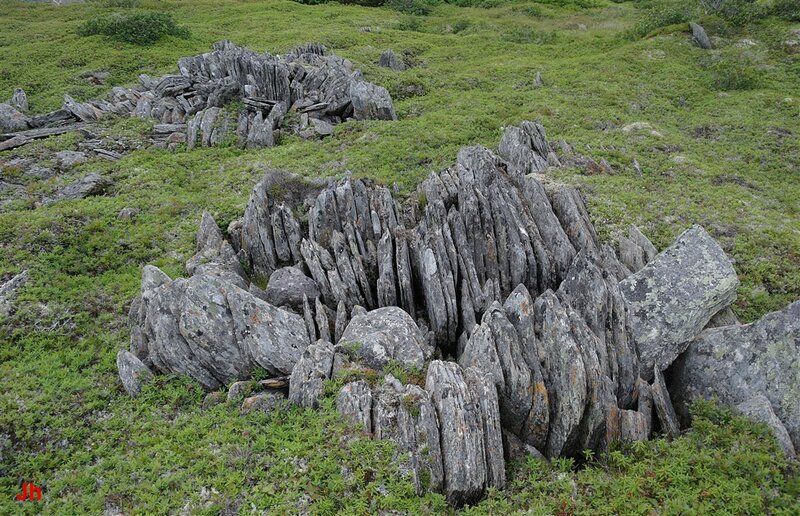 Periodic widening of joints in ice-disrupted volcanic rock is often seen in bedrock outcrops that accompany, but do not themselves display, frost-heaved monoliths. Examples are shown below. 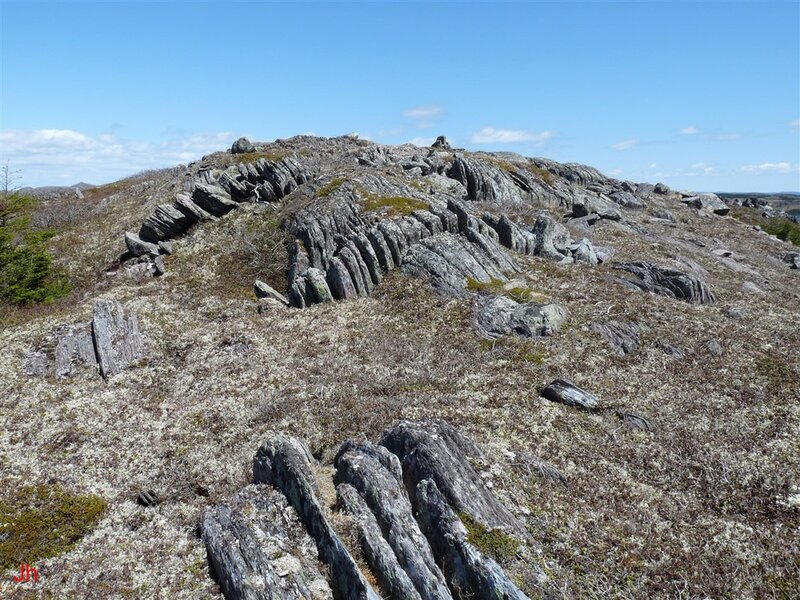 It is difficult to determine whether the relatively widely-spaced repeating joints/fissures seen in the above photos were initiated by subglacial frost wedging, or whether they were caused by direct glacial loading of the bedrock. 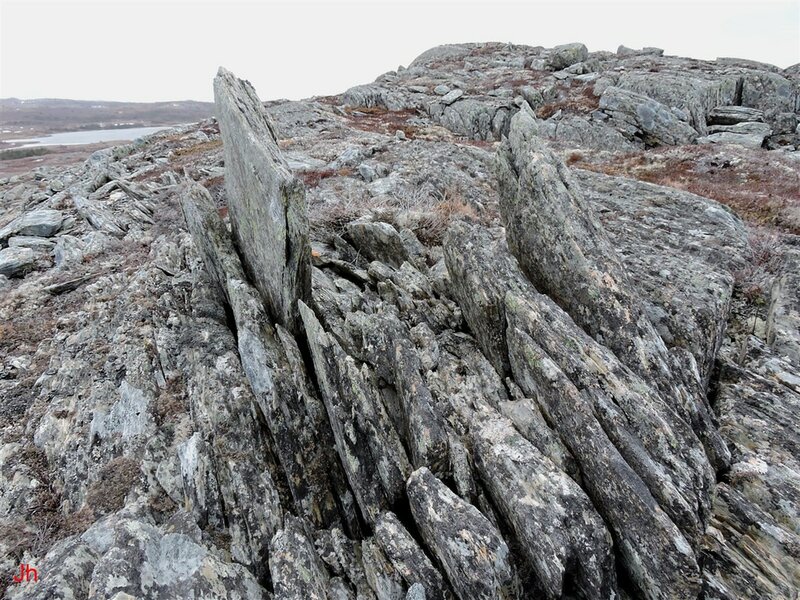 Glacial loading can shift significant sections of bedrock, creating repeating faults which can then be widened by subsequent frost wedging or weathering. The last (bottom, right) photo appearing above shows highly disrupted volcanic bedrock that was affected by subglacial ice segregation, the ice segregation possibly commencing in joints/faults initially widened by glacial loading. 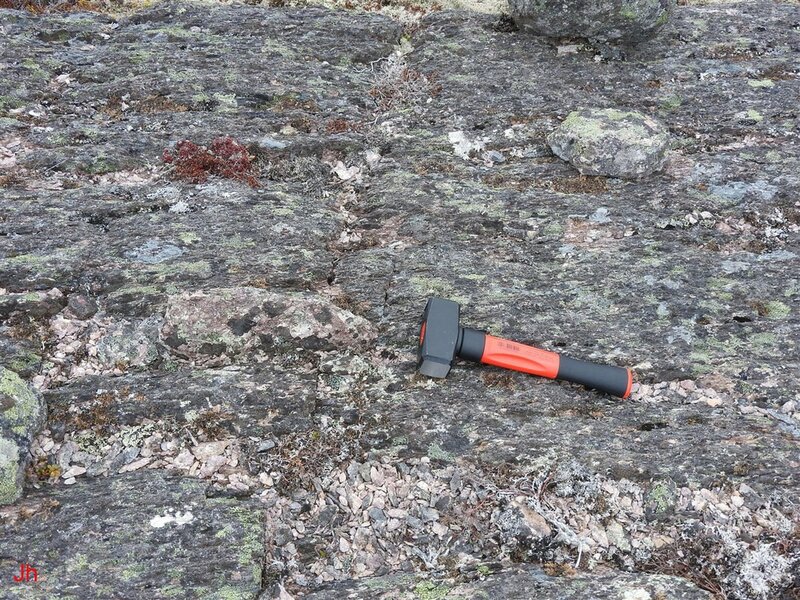 The photo below shows a glacially smoothed surface on volcanic bedrock. The surface has been strongly etched by a combination of recent erosion by rainfall and by freeze-thaw weathering. 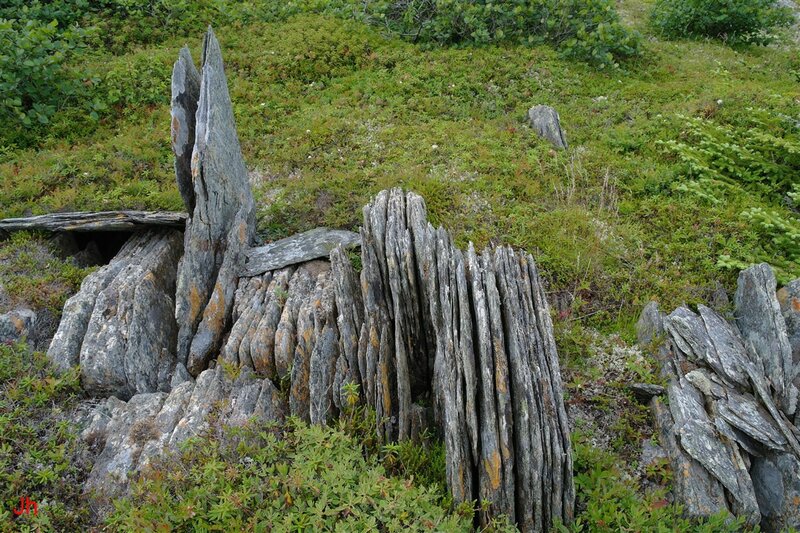 The freeze-thaw weathering is proceeding quite rapidly as evidenced by the numerous loose chips of rock (white) that have spalled off the grooved surface of the dark (lichen-covered) bedrock. 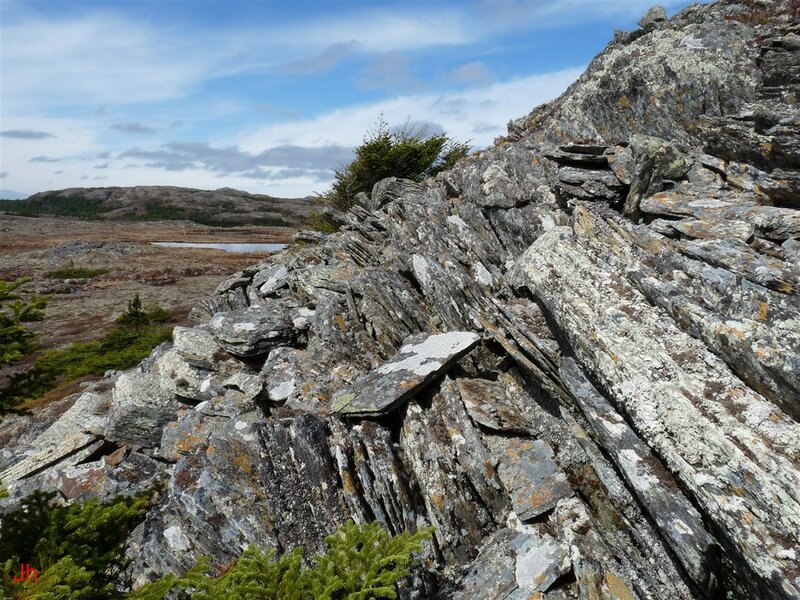 The bedrock outcrop shown above is strongly layered (vertically-dipping layering best seen at bottom left of photo) and occurs in an area of frequent and severe ice-disrupted bedrock and abundant frost-heaved monoliths. 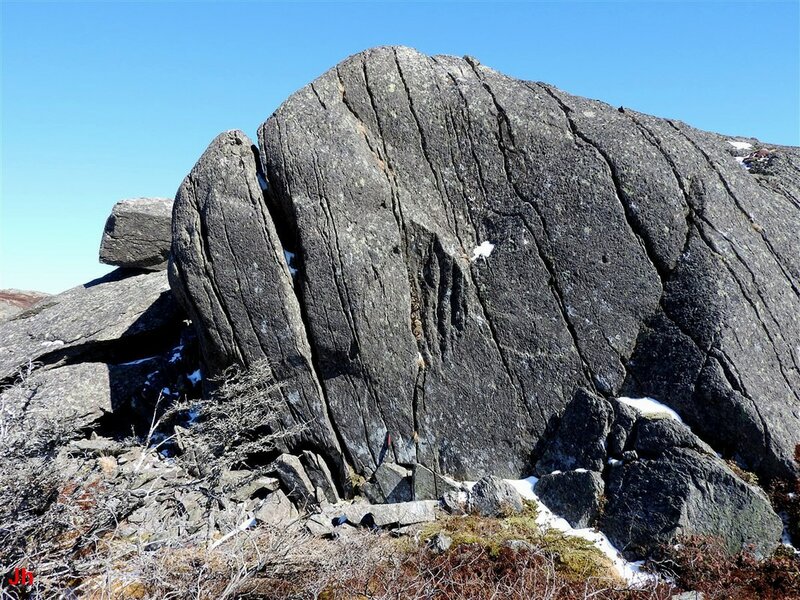 It is probable that the bedrock incorporates a dense pattern of periodic frost-widened joints, and that these joints underlie the erosion that gives the rock its grooved surface appearance. The indicated rapid freeze-thaw weathering is likely the result of surface water penetrating into the widened joints. 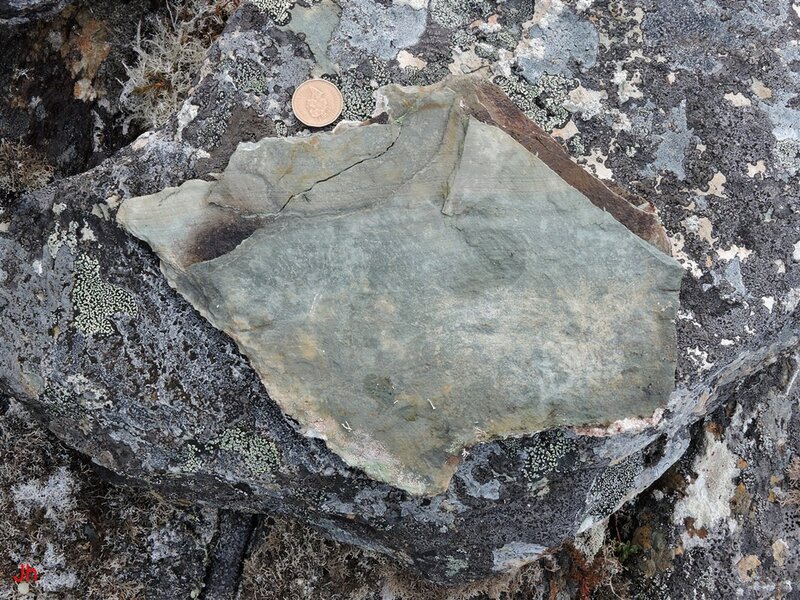 1) Phyllosilicate-rich host bedrock, both clay-bearing siltstone and metasomatized (hence hydrated) volcanic rock. 2) Widespread low grade regional metamorphism affecting the entire area. 3) A heavy burden (500+ meters thickness) of Pleistocene temperate glacial ice, potentially pressurizing bedrock aquifers to 5+ MPa. 4) Complete deglaciation of some areas during the cold Younger Dryas period, allowing ice segregation to occur beneath thinning cold-based glaciers. 5) As an alternative to 4), or complimentary to 4), extremely rapid downwasting of cold-based glaciers following abrupt climate change (warming) at the end of the Younger Dryas. 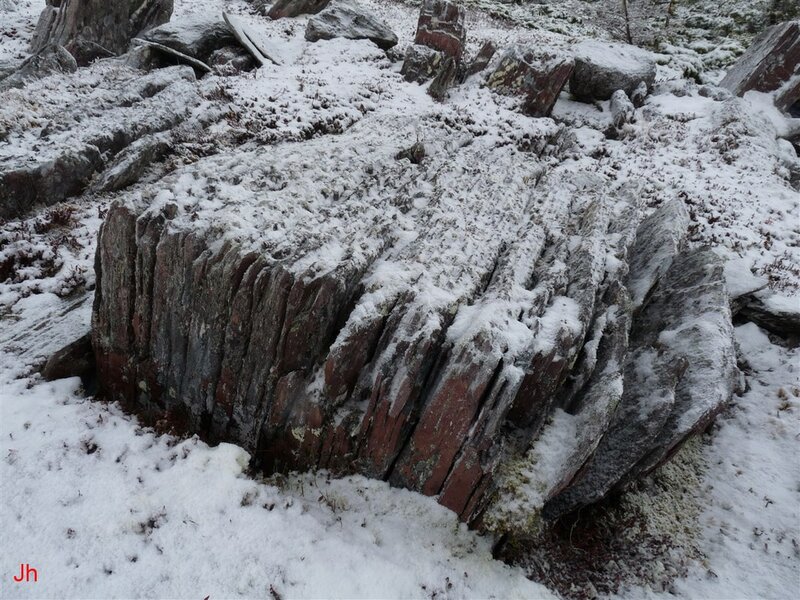 The above photo shows a small, layered frost heaved monolith occurring in metamorphosed siltstone. The feature is about 30 cm long and 10 cm high. 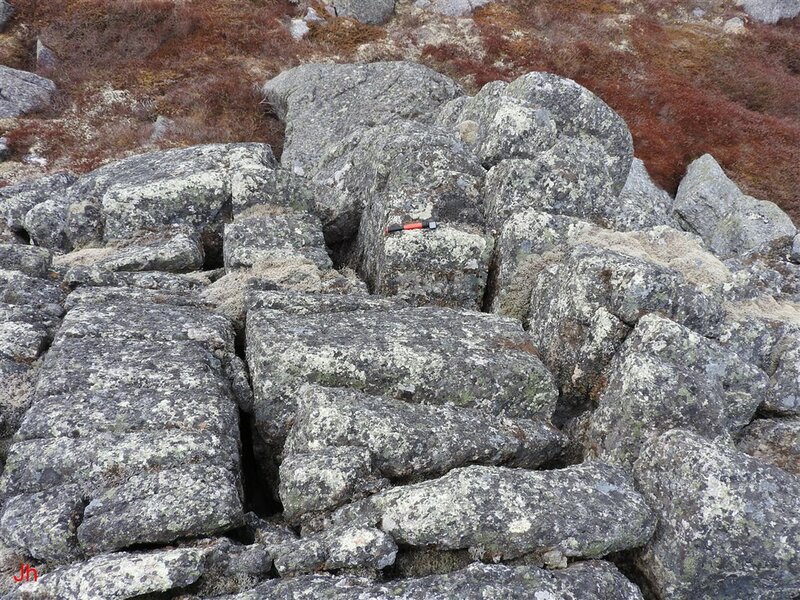 Small frost-heave features like this are common in rock that shows indications of finely spaced periodic joint widening. There is substantial evidence that these small features are subglacial in origin and hence that they predate the Holocene. The existence of small bedrock frost-heave features as illustrated above suggests the possibility of simulating the conditions of their formation in a laboratory environment. A block of appropriate rock, laterally confined and pressurized to 5 MPa with zero deg. water, could be cooled to subzero temperature and depressurized while maintaining a mild vertical temperature gradient (colder at top). The results of such an experiment would help assess the validity of the subglacial ice segregation/cold deglaciation model. More importantly, it would be interesting to observe how water molecules move through the cold rock and at what rate. 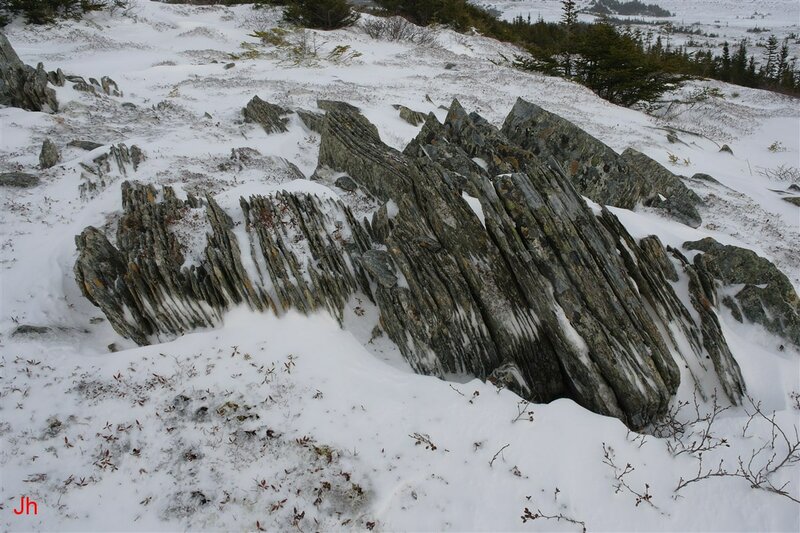 Recent observations (description pending) unambiguously demonstrating the past occurrence of prominent, large-scale non-tangential glacial ice flow on the Avalon Peninsula warrant discovering how and why significant volumes of ice emerged from frozen bedrock. Such knowledge might be of interest in planetary science. For example, some areas of Mars might have experienced an episode of cold deglaciation sometime in the planet's geologic history. 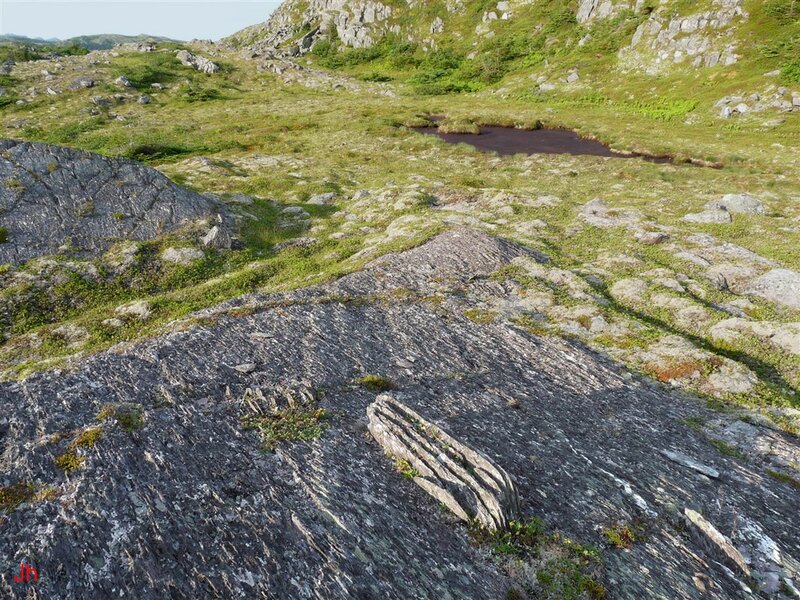 The first (left) photo above shows an area of ice-disrupted bedrock. The orange hammer laid on the layered joint block (above center in the photo) is 26 cm long. The bedrock is metamorphosed siltstone. 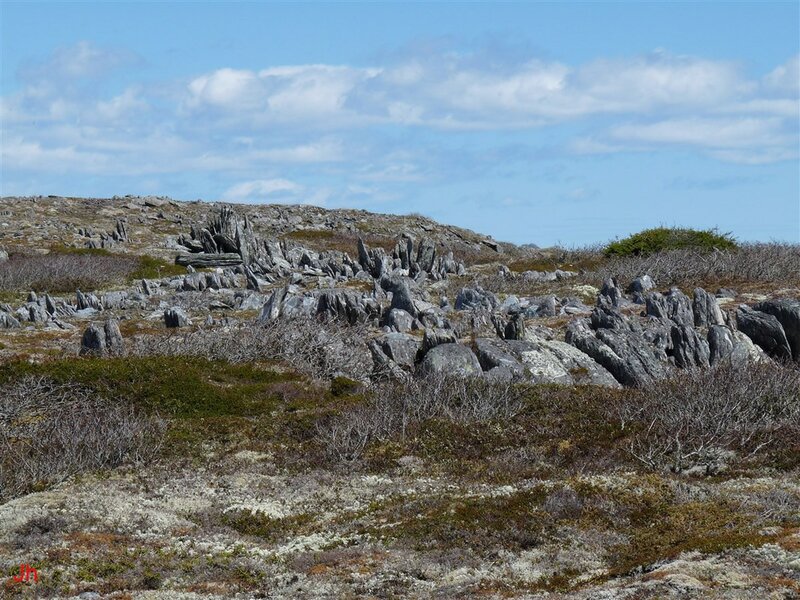 The nearby area included numerous small frost-heaved monoliths, one of which was taken up and placed on the joint block appearing in the second (right) photo above. This sample was retrieved and used for a specific gravity measurement. The sample was dried by heating to 150 deg. C for 6 hours before testing. The dried sample weighed 1.153 kg and had a specific gravity of 2.65. 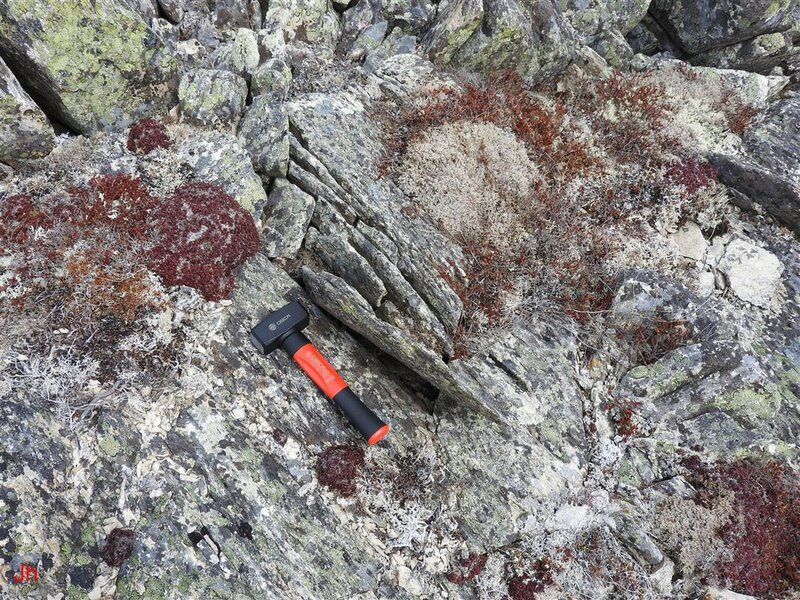 The specific gravity, typical of common silicate rocks, implied that this sample had not been significantly expanded by small-scale internal frost wedging. The experiment, as described above using the sedimentary rock, was then repeated using a small frost-heaved sample of volcanic rock. 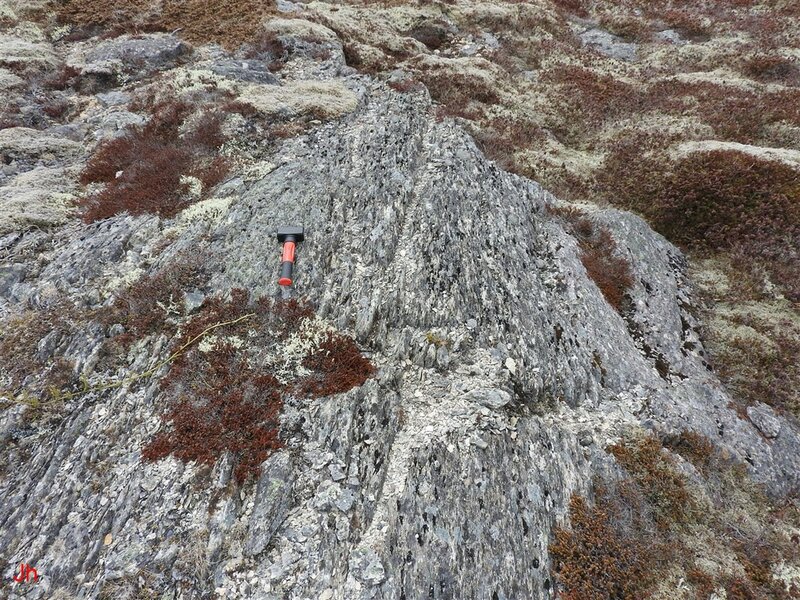 The above photo shows a small frost-heaved monolith (hard to discern, just left of hammer) in volcanic bedrock (metasomatized, regionally metamorphosed ignimbrite). 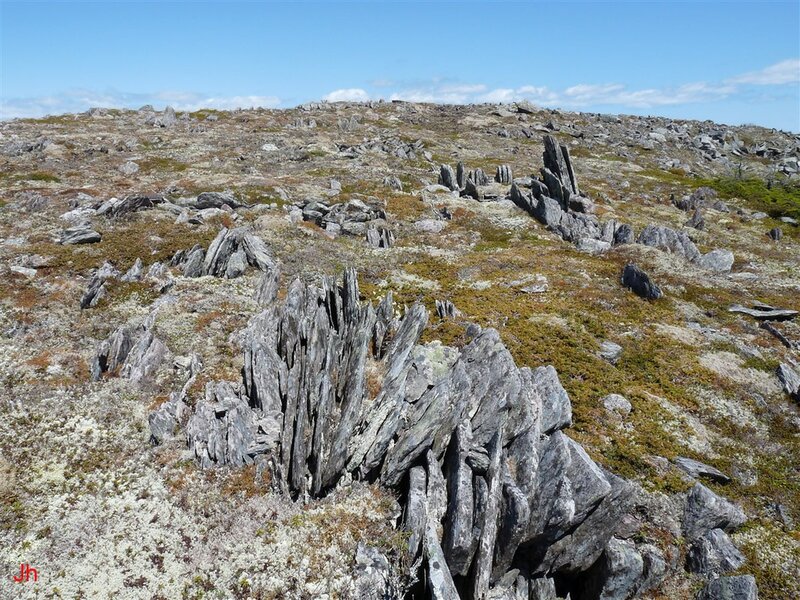 The surrounding area featured numerous substantial frost-heaved monoliths and areas of ice-disrupted bedrock, occurring in rock incorporating densely spaced repeating frost-widened joints. The small frost-heaved monolith was retrieved, dried and measured to determine its specific gravity. As with the previously described sedimentary rock, the specimen (weight = 2.096 kg, S.G. = 2.66) showed no indication of having been expanded by small-scale internal frost wedging.